Avoiding crowds is important for those of us seeking peace and quiet in the Smokies. The Great Smoky Mountains National Park is the most popular national park in the U.S. Last year, over 9 million people visited the Smokies. The good news is that despite the number of people who visit each year, you can still enjoy the Smokies! There are 2 peak seasons: June 15-August 15 and the month of October. The busiest month is July. The most crowded places are the Cades Cove Loop Road and Newfound Gap Road. The busiest hiking trails are Abrams Falls, Alum Cave to the bluffs, Appalachian Trail from Newfound Gap to Charlies Bunion, Chimney Tops, Forney Ridge to Andrews Bald, Laurel Falls, Trillium Gap to Grotto Falls, Ramsey Cascades, and Rainbow Falls. I know what you're thinking. "But those are all great trails!" Yes, they are, and I definitely recommend hiking them, but why not check out some of the lesser-used trails. If you're going to be in the Smoky Mountains during the busy season, check out some of the lesser-used places like Cataloochee or Cosby. If you go to Cataloochee, the Hemphill Bald/Cataloochee Divide Trails are both must-hikes. The views alone are worth it. If you're into history, check out Little Cataloochee Trail. 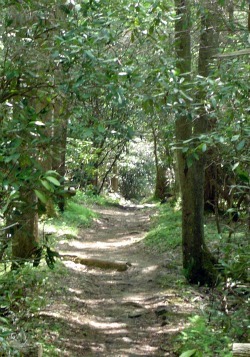 A great hike near Cosby is Mount Cammerer. Awesome views here too. Hiking on a weekday before 10 A.M. or after 4 P.M. will also help you avoid the crowds. Keep these tips in mind and you'll enjoy the Smokies, even during the busy season!